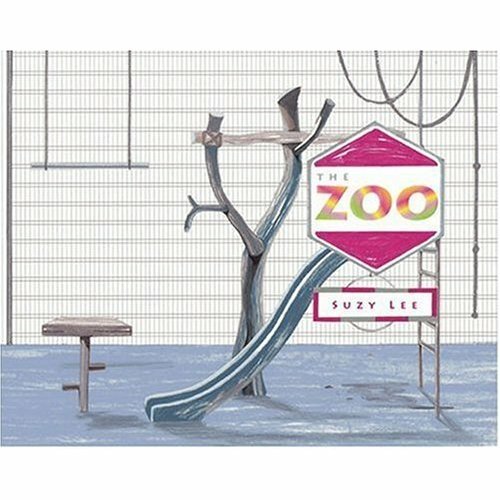 First I am going to say a few words about the Author/ Illustrator, Suzy Lee. Suzy is an artist at heart. Her books use few, if any, words. However, you cannot deny that Suzy is telling you tales full of playfulness, imagination and intrigue. Her brilliant, controlled use of color to strengthen her stories, and her illustrative style that brings expression and character to inanimate objects (ex. an ocean wave or the contents of a broom closet) has made her a favorite in my library. Suzy Lee is best known for her book Wave, which has become enormously popular recently. It is a wordless book depicting energetic charcoal sketches of a girl playing on a beach among the splashes and waves of a crisp blue ocean. This is a treasured book in our home. The Zoo is a lesser known book. When I stumbled upon Wave several years ago, I took a chance and ordered The Zoo sight unseen. I was not disappointed. The Zoo is not a wordless book, but the text is minimal. Again, Suzy uses her power of illustration and control of color to pull her reader through the story. The short and direct narrative is told through the eyes of a little girl brought to the zoo by her parents. The illustrations on these first pages are dull, washed out grey tones as the girl visits empty cage after empty cage with her parents. Suddenly you are introduced to a colorful peacock who captures the attention of the little girl. As she absentmindedly wanders away from her parents to follow the peacock, the greyscale background of the empty zoo melts away into a vivid green one. The following pages are a contrast between her parents search for the girl in the grey empty zoo and the girl's adventures in the colorful oasis of animals. "We watched the hippos in their pool," the girl narrates, on a greyscale page where her parents are searching for her at the empty hippo pool. The following page shows the peacock leading the girl to a colorful pond with happy hippos and monkeys who have escaped their drab cages. In the end, she is found by her parents asleep on a zoo bench. As the relieved parents carry her home, the animals in the background are watching her go and, as she smiles at them, the girl states, "I love the zoo. It is very exciting." The narrative only follows the girl's perspective of her adventures with the animals, but you SEE the contrast of the empty cages and parents. Many authors would have left the parents behind and told only the story of the girl's adventure, but Suzy did not. Some parents may find this choice to be a criticism; that you see the frantic parents searching for her and that she was truly missing rather than a dream as she dozed in a stroller. This may be a deal-breaker for some parents, as it does capture the frantic nature of the 'wandered-off child'- in one Amazon reviewer's words, 'the parents' fear is palpable.' But I believe that the contrast of narratives is part of what makes this such a unique and worthwhile read.